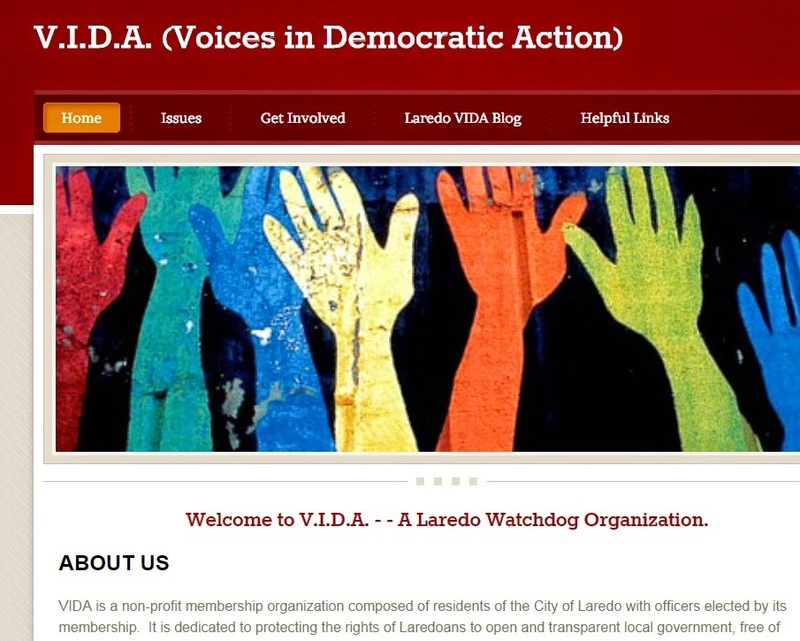 VIDA, a local watchdog group, met recently to plan a course of action heading into the future. 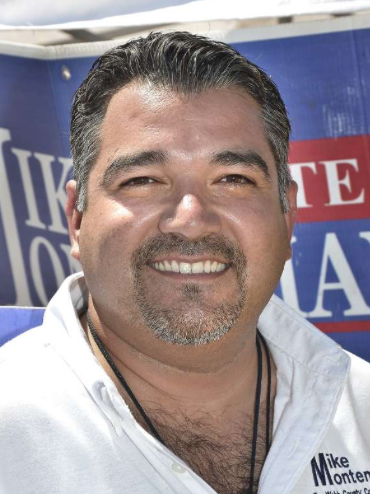 The organization was sidetracked in 2012 when Eduardo Garza, of Uni-Trade fame, sued them for defamation. But now they are looking to reorganize and recruit new members. 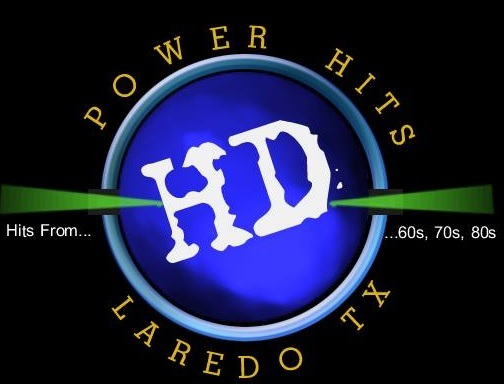 VIDA will make a public announcement soon to invite the community to take a more active role in what happens in Laredo and Webb County. Jesus Olivares and Carlos Villarreal were okay with the deal the city (and Garros) got. 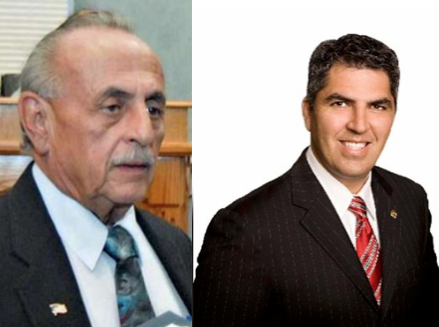 The new mayor and city council will soon hear from VIDA. The city will have to be reminded that people haven't forgotten about this. So stay tuned to see what's next, and if you want to get involved, get ready. 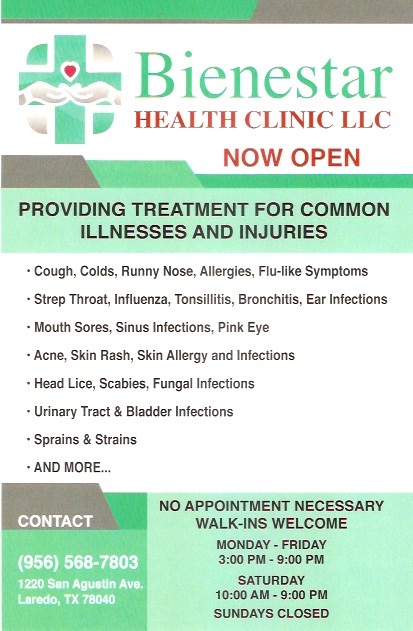 If you have any questions, you can contact me; just click on my name at the bottom of this post. And do yourself a favor and listen to my latest podcast. Tell me what you think. Yesterday marked the first day of Spring. The weather has been mostly gloomy lately. An occasional sunny day has popped up, but the recent rains have made things unpredictable. 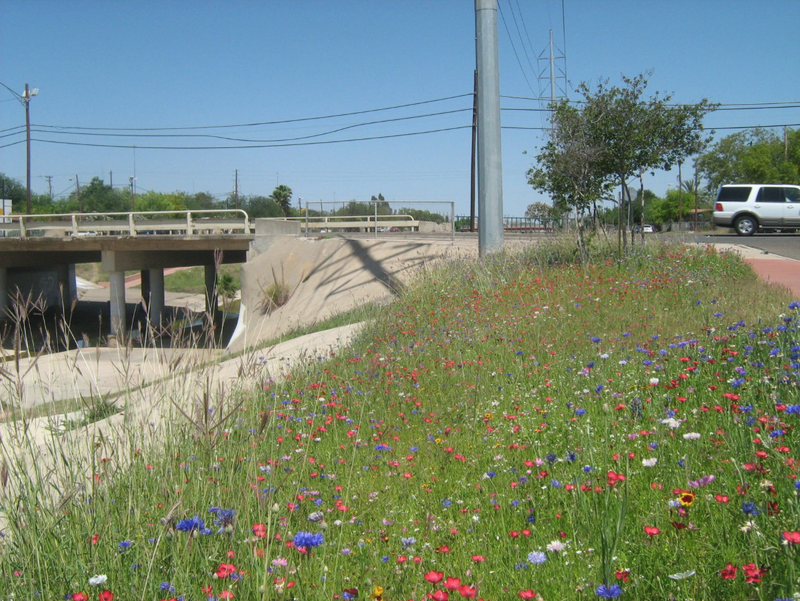 The bright spot in all of this is the proliferation of wildflowers throughout town. 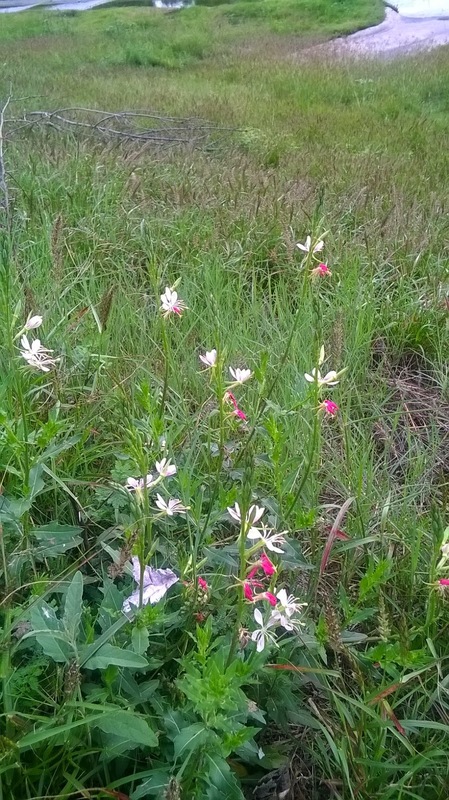 The flowers pictured above I saw along Zacate Creek, near Saunders. And in another section there were different varieties. This year I've enjoyed other wildflowers that have come up in south Laredo and in an area near the cemetery. 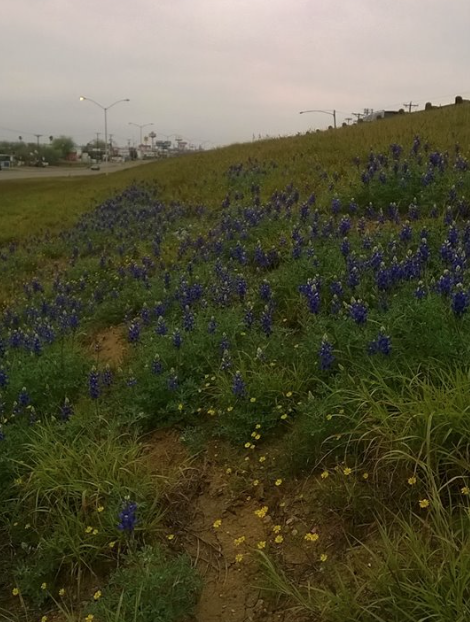 Bluebonnets were spared the mower along Zapata Highway. Public spaces have so much potential to become showy, wildflower meadows for the public to enjoy each Spring. Natural displays like the ones pictured above require some planning and care. However, not much elbow grease is needed. 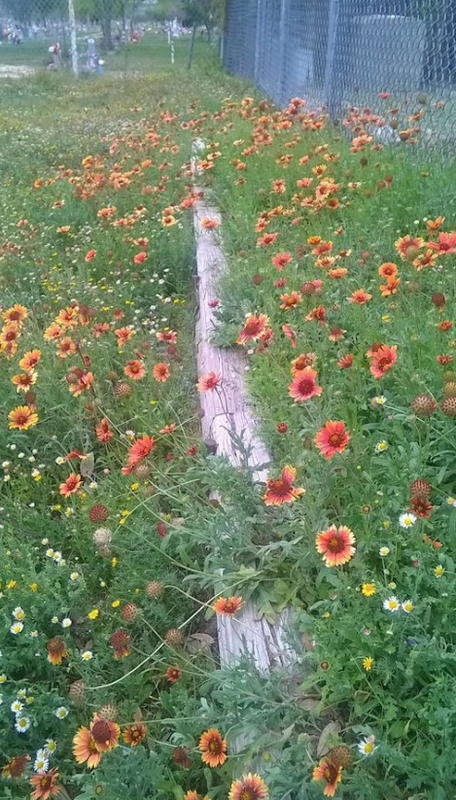 I've observed that some wildflowers, like the Indian Blanket above, have spread throughout the Santo Nino neighborhood, sometimes into vacant lots. I think we as caretakers need to know just when to stand back and let nature take its course. 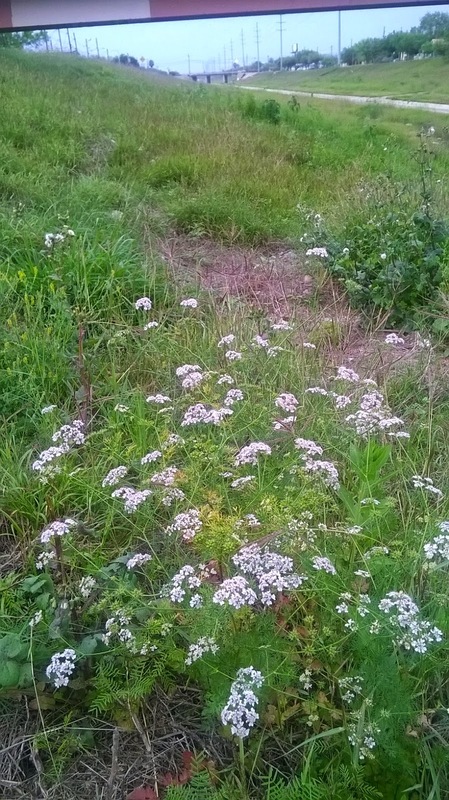 Currently in the Zacate Creek (between Saunders and Lyon St.) you can enjoy a smattering of perennial wildflowers, but they're located on the creek slopes. The lush presentations of years back are not in view because those patches are the only ones that have been extremely mowed down. Perhaps the areas have been prepped for an Easter showcase but I'll know in a couple of weeks if those former flowers come back. 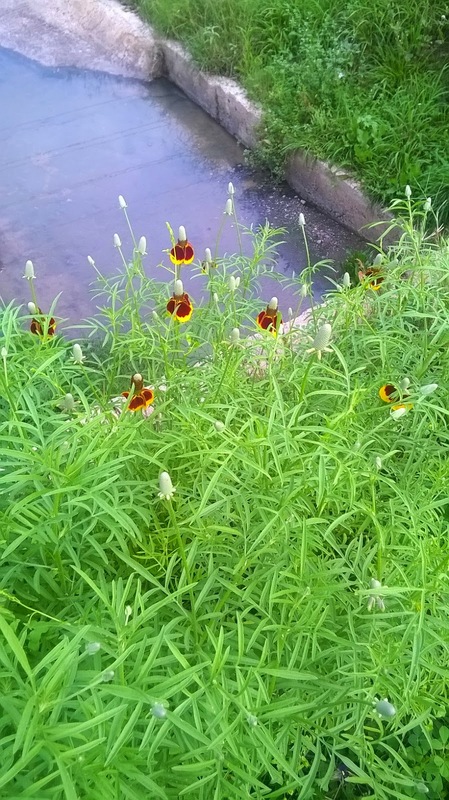 Varieties of wildflowers are already in place along the creek. I think we just need to guide them in spreading farther and wider. It was two weeks ago that city leaders visited Washington to lobby officials for money. Nobody questioned whether council members took family members along, or how the trip was funded. 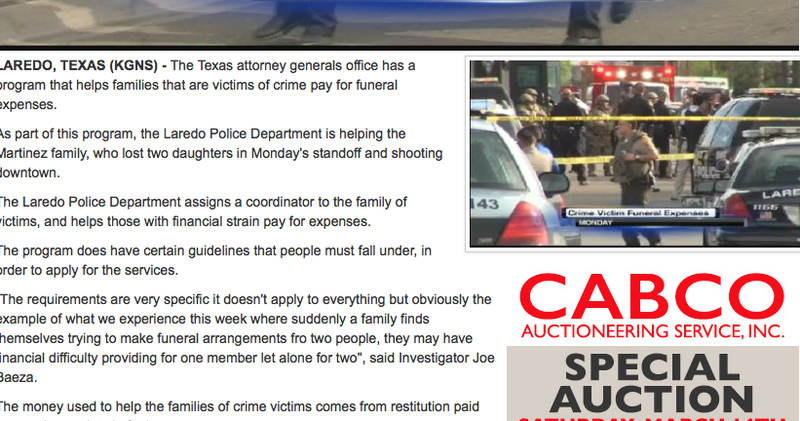 Trivial queries, perhaps, but I would think local media outlets would jump on those matters to fill their news quota. 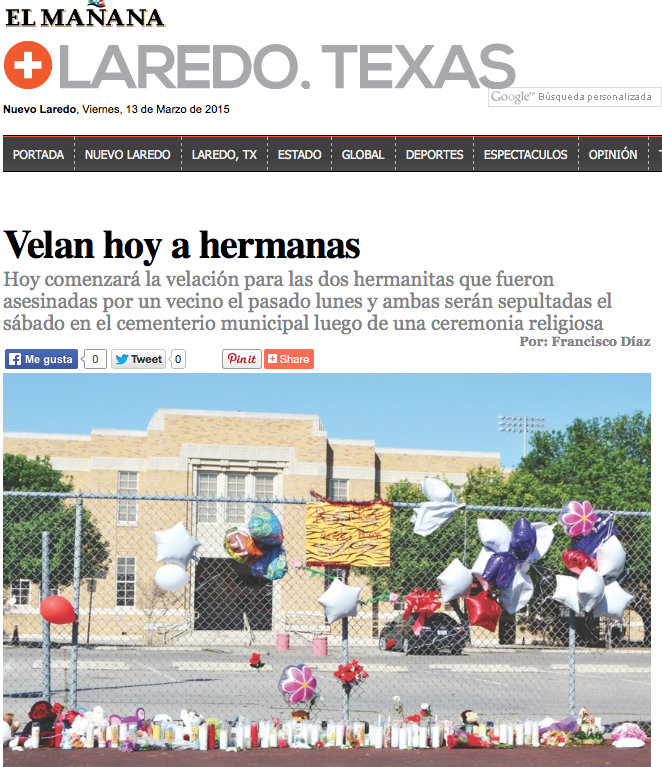 Anyway, the gains the City of Laredo made in D.C. are unclear. There hasn't been the usual boasting like we've seen in the past. Maybe it's because the former city administration was challenged on what benefits it reaped from making the trip that they had to say something, like bringing back funding for the COPS program. The only story I saw in the news last week was with an airport official talking about trying to get a new traffic control tower. Apart from airport operations, the health department needs federal money to keep its various programs going. 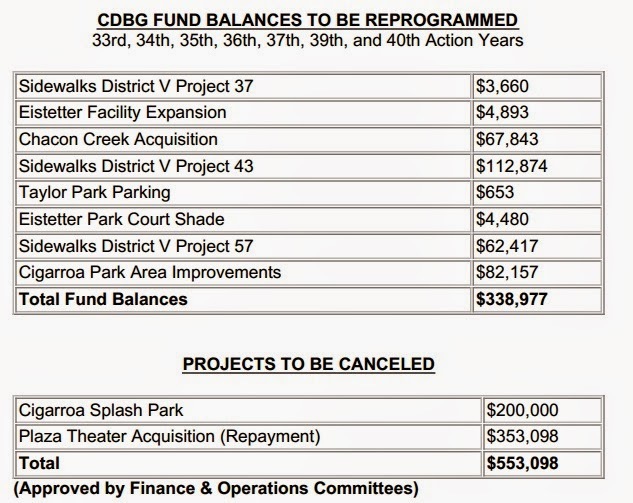 However, what keeps the world turning for each council member are community development block grants (CDBG). Those monies allow our elected officials make neighborhood improvements, and thus, use those completed projects as campaign propaganda. I would do the same, I guess, if I held office. Some projects take forever to become reality. The Chacon Creek Hike and Bike Trail started as an idea in 2009. In current workings, the city is looking to spend $67,843 on "Chacon Creek acquisition" (see figure above) whatever that means. On the bright side, at least city officials haven't totally abandoned the trail project. One day I see it becoming a complete reality. And perhaps then I'll still be able to ride my bike on the trail. As far as the Plaza Theater, I think that boat has sailed. A family is mourning the loss of two of its own. 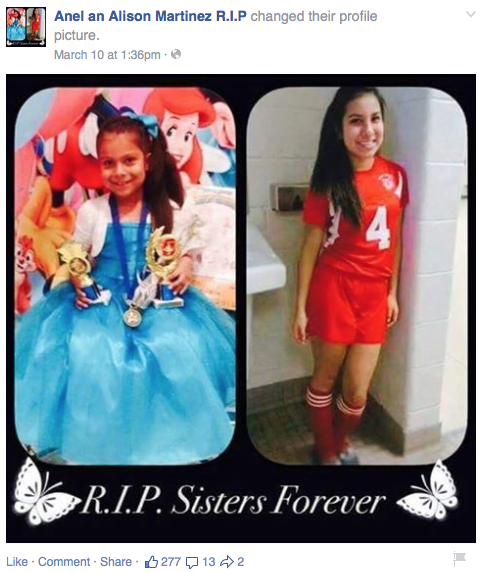 Anel and Allysson Martinez died Monday. A neighbor, demanding money, got into an argument with the girls' mother. When his demands were not met, he pulled out a gun. 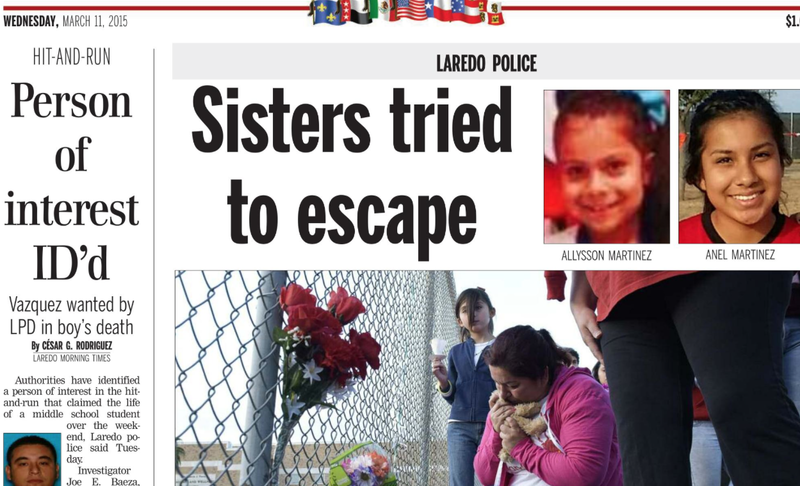 The two girls, Anel & Allysson, ran out towards the back of the house, but couldn't escape. The neighbor chased after them and opened fire. They were rushed to the hospital in the middle of a police standoff. Both were pronounced dead at the hospital. The public first learned of the identity of one of the girls when a picture of Anel, a Martin High School student, was posted Monday afternoon on Facebook. A black ribbon was placed alongside her image. Soon after, her sister's photo appeared, and the community came together in praying for the family. A candlelight vigil was held on the Civic Center grounds on Tuesday. 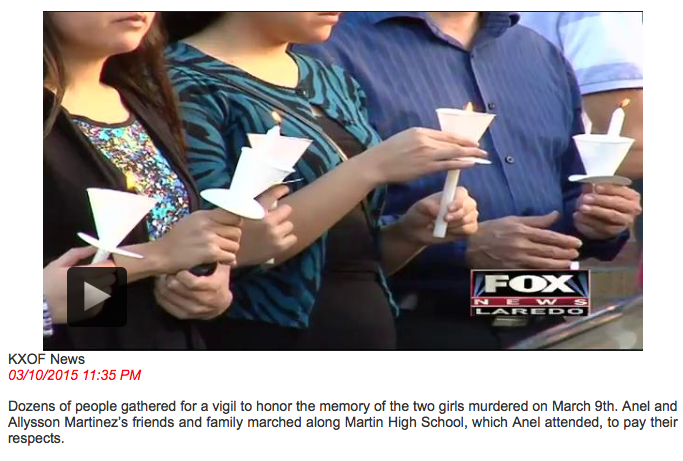 Donation drives were coordinated by several groups throughout Laredo in an effort to help the family of Anel & Allysson. 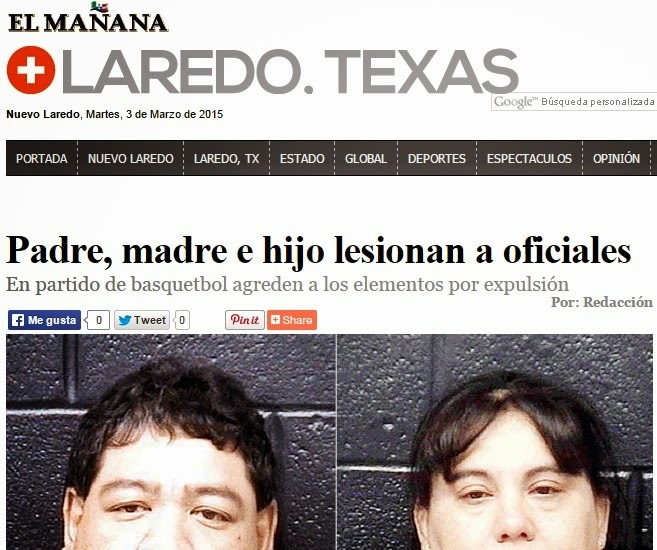 The Laredo Police Department promised a monetary donation to the Martinez family. Funeral services are set for tomorrow. Our thoughts are with the Martinez family. Parents who became upset, after their son was ejected from a basketball game, were arrested Saturday. It all started when the son, playing at the Haynes Rec Center, got into a scuffle with another player. A security guard escorted the young man out of the facility, and the parents followed, taking umbrage with the official. Things escalated and reinforcements had to be called in. I've heard about this sort of thing happening, where parents fight other parents, or get into it with those officiating a game, but this is the first I know of when people actually get hauled off to jail. Youth sports get competitive and tempers flair sometimes. When parents get emotionally and physically involved with others, instead of just being spectators, they prove that there is one more way to embarrass the kids. 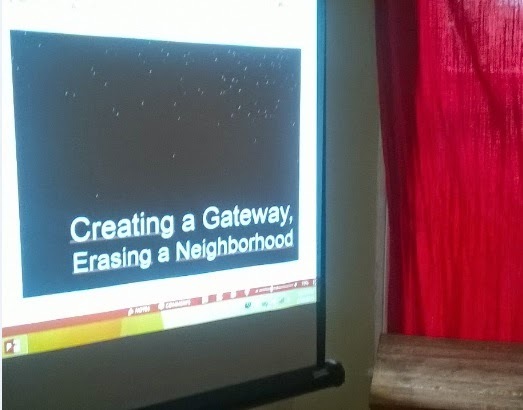 The St. Peter's Historic Neighborhood Association hosted an event at Caffe Dolce on Saturday. 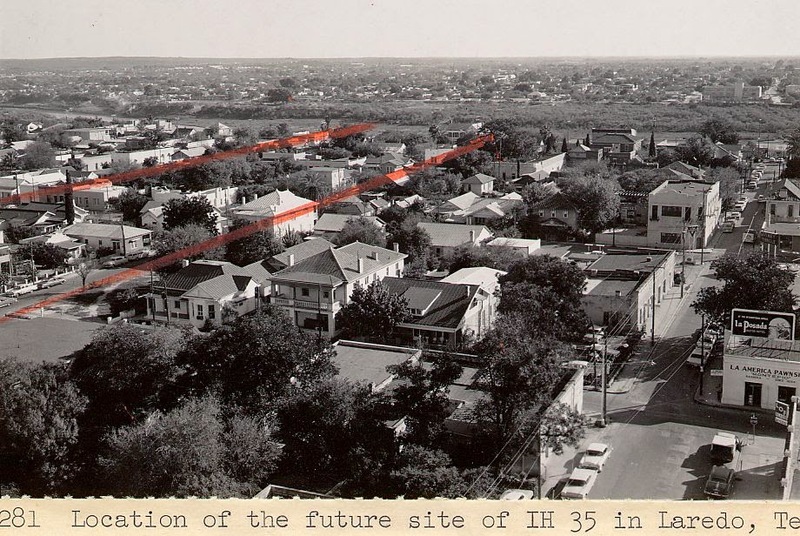 "Creating a Gateway, Erasing a Neighborhood" told the story of the barrio that was wiped away to allow for roadway construction leading from the I-35 terminus, to what would become the Juarez-Lincoln Bridge (bridge 2). 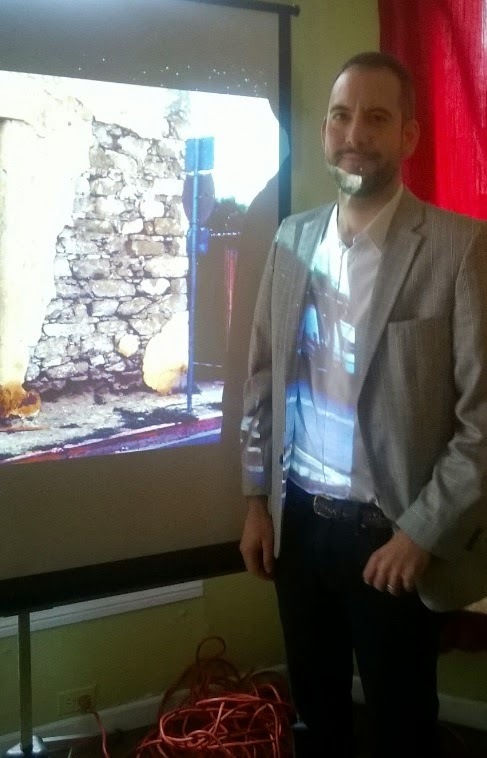 Guest speaker Jesus Najar, of the Texas Historical Commission, spoke about the evolution of Laredo's original business district, its surrounding neighborhoods and the trade corridor that looks so different from when it was first built in the 1970s. There were many forces that led to the demise of so many historic homes in what was the La Noria neighborhood. 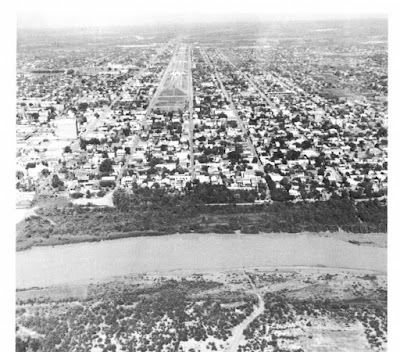 In order to make headway towards the river, Najar cited propaganda efforts on the part of officials against those who still called the area home. A new international bridge connecting to I-35 meant progress for some, but it came at a cost. Not only were people displaced, but scores of homes and businesses - rich with history and culture - were simply razed, with no thought of their value to the community. Jesus Najar spoke of the way the area was characterized at the time, as an aging neighborhood with dilapidated, boarded-up buildings. People in attendance suggested that the Noria 'hood was dismissed partly because of the development taking place in northern Laredo. Homes that dated back to the 19th century were of no use for those who stood on the side of modernization. 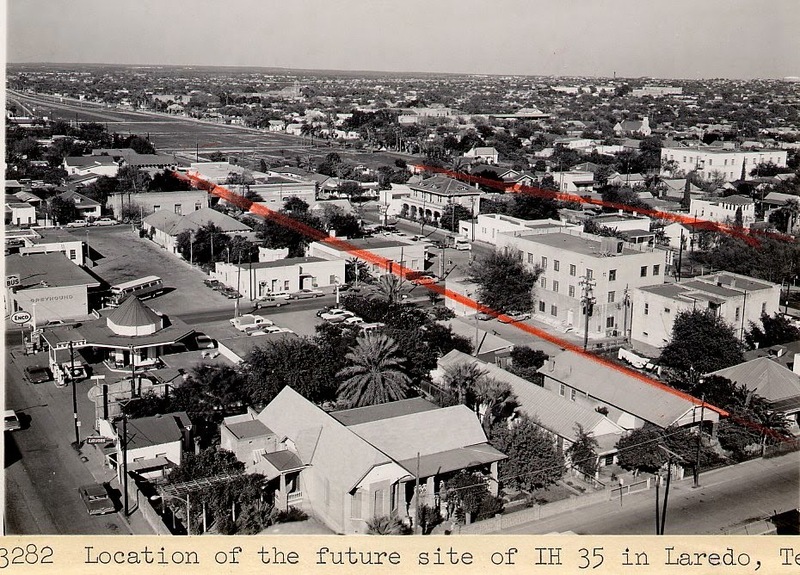 Progress eventually came, but at great cost to Laredo's origins and soul. Mr. Najar said bridge 2 didn't see its full completion until 1981. 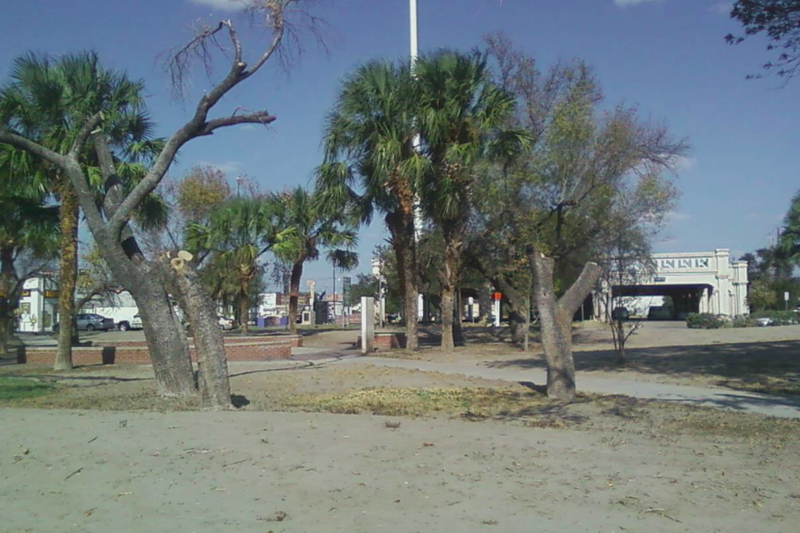 The 'plaza de la noria' park is still with us, but seems like a shadow of its former self. 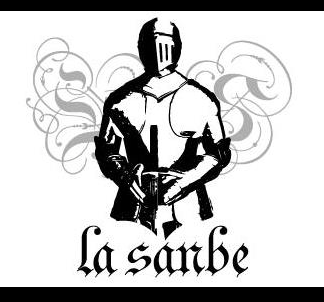 It still has some semblance to what it once looked like, but it hasn't been given much thought about what it stood for. 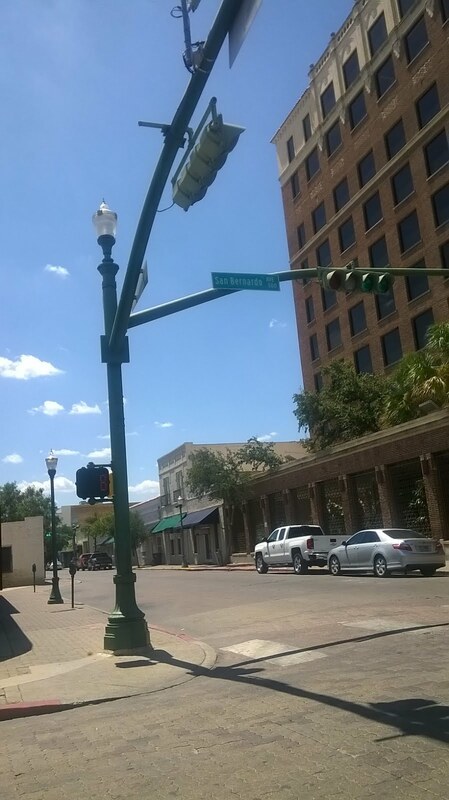 In the background, you can see the bank with the giant flag pole on the corner of Santa Ursula and Matamoros. La escuela amarilla (1910) used to be there. UPDATE on 12/12/2016: Image above shows neighborhood in place before bridge 2 constructed. Photo obtained from a Center for Transportation Research Library (Twitter) post.